A Sniff Test for Alzheimer’s? A poor sense of smell may be a sign of impending Alzheimer’s disease, a new study reports. The findings suggest that a simple test to measure someone’s ability to detect various scents could be used as a way to detect Alzheimer’s early, when treatments may be most effective. 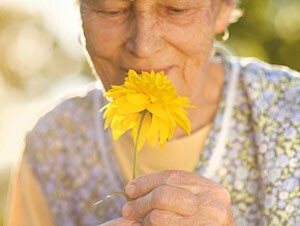 Other studies have suggested that a poor sense of smell may be a harbinger of Alzheimer’s disease. But this was the largest study to date, involving 1,430 men and women who were part of the Mayo Clinic Study of Aging. Their average age was 80, and all were free of Alzheimer’s disease or other serious memory problems at the start of the study. Study participants were given smell tests every 15 months, over the course of about three-and-a-half years, in which they were asked to detect six food and six non-food smells. The food smells consisted of banana, chocolate, cinnamon, lemon, onion and pineapple. The non-food smells were gasoline, paint thinner, rose, soap, smoke and turpentine. The tests were inexpensive and easy to administer in a clinic setting, and did not require interpretation by trained personnel. 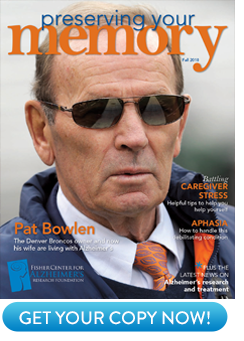 At the end of the three-and-a-half-year study period, participants were assessed for signs of Alzheimer’s disease and mild cognitive impairment, a form of memory loss that often precedes Alzheimer’s. During the study period, the researchers identified 250 new cases of mild cognitive impairment and 64 cases of Alzheimer’s disease or other forms of dementia. The researchers found that those who scored lowest on the smell tests were significantly more likely to develop the serious memory problems of mild cognitive impairment or Alzheimer’s. Those who scored the lowest on the sniff tests were also most likely to have progressed from mild cognitive impairment to Alzheimer’s disease, the researchers found. “Our findings may be useful as a marker for early detection of persons at risk for mild cognitive impairment or Alzheimer’s disease,” the authors conclude. The findings appeared in JAMA Neurology, a journal from the American Medical Association. Researchers aren’t sure why Alzheimer’s may impair the sense of smell, but one hypothesis is that the disease damages the olfactory bulb, an area of the brain responsible for detecting scents. Other research suggests the offending culprit may be beta-amyloid, a toxic protein that builds up in the brains of those with Alzheimer’s. It’s important to note that a poor sense of smell does not mean you will get Alzheimer’s. An impaired sense of smell can be caused by many conditions other than Alzheimer’s, including medications, viral illnesses, head injuries or nasal conditions. In addition, many people with Alzheimer’s retain their sense of smell, so a sniff test is by no means foolproof. But earlier detection of Alzheimer’s may allow for treatments that may be more effective in curbing the progression of the disease. An inexpensive sniff test might also prove to be useful for identifying patients who might be candidates for more extensive testing with brain scans, the researchers say. Source: Rosebud O. Roberts, MD, ChB; Teresa J.H. Christianson, BS; Walter K. Kremers, PhD; et al: “Association Between Olfactory Dysfunction and Amnestic Mild Cognitive Impairment and Alzheimer’s Disease Dementia.” JAMA Neurology, published online Nov. 16, 2015.